Most Adults Have Gum Disease. Periodontist in Boston Knows How to Prevent It. It makes sense that your mouth is the gateway to the rest of your body. Dr. Schrott, your periodontist in Boston, knows there is a strong connection between your gums and your overall wellbeing. Your periodontal (gum) health can affect or be affected by what’s going on in the rest of your body. For example, did you know that pregnant mothers with advanced levels of gum disease are more likely to experience premature birth or low birthweight? And periodontitis (another word for gum disease) seriously affects your cardiovascular health, too. But there is good news. It’s easy to prevent gum disease — it just takes a little effort on your part. 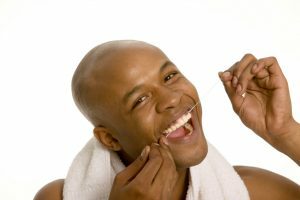 Improving your dental hygiene is an important step in promoting healthy teeth and gums. That means brushing your teeth for two minutes, twice a day (or even after each meal), and flossing daily. Visiting your dentist regularly is another crucial aspect of preventing gum disease. Undergoing a checkup and cleaning every six months allows us to clean off the plaque and tartar that causes the condition. And with regular appointments, we can also catch and treat any infection as soon as it develops. Tobacco use of any kind is closely linked to gum disease — whether it’s cigarettes or smokeless tobacco. Want to keep your gums healthy and prevent tooth loss, bad breath, and the associated health risks of infected gums? Kick the habit. Talk to your doctor or dentist if you are ready to quit but are unsure how to go about it. Do you suspect you have gum disease? If you have red, bleeding, tender gums and persistent bad breath, it’s a good idea to schedule an appointment for a periodontal exam. Dr. Schrott will measure the depth of the pockets between your teeth and gums. Deep pockets indicate the presence of infection and the need for treatment. If Dr. Schrott determines that you are exhibiting the signs of gum disease in your checkup, he will recommend a treatment plan. In its beginning stages, gum disease can be reversed with improved oral hygiene and a few extra visits to the dentist. Brush more effectively, floss better, visit your dentist regularly, and you will likely notice improvement in a short period of time. Once gum disease has progressed past its beginning stages, a deep cleaning will be necessary. Also known as scaling and root planing, the treatment involves reaching below the gum line to remove tartar and bacteria buildup from the tooth’s root. Scaling and root planing may be combined with antibiotic therapy and carried out over several appointments. Do you suspect you are suffering from gum disease? Or maybe it’s just been awhile since your last visit to the dentist. Either way, don’t wait to schedule an appointment. Gum disease caught in its earliest stages is usually easy to reverse. Request a visit at Kraft & Schrott Dental Associates today! Comments Off on Most Adults Have Gum Disease. Periodontist in Boston Knows How to Prevent It.